เวลา 21.00 น. ปล่อยตัวนักกีฬาระยะ 50 KM Cutoff 14 ชม. เวลา 24.00 น. ปล่อยตัวนักกีฬาระยะ 25 KM Cutoff 7 ชม. เวลา 06.00 น. ปล่อยตัว 10KM Cutoff 3 ชม. “No room for the weak” is a definition of Thai Navy's Sea, Air and Land Teams. 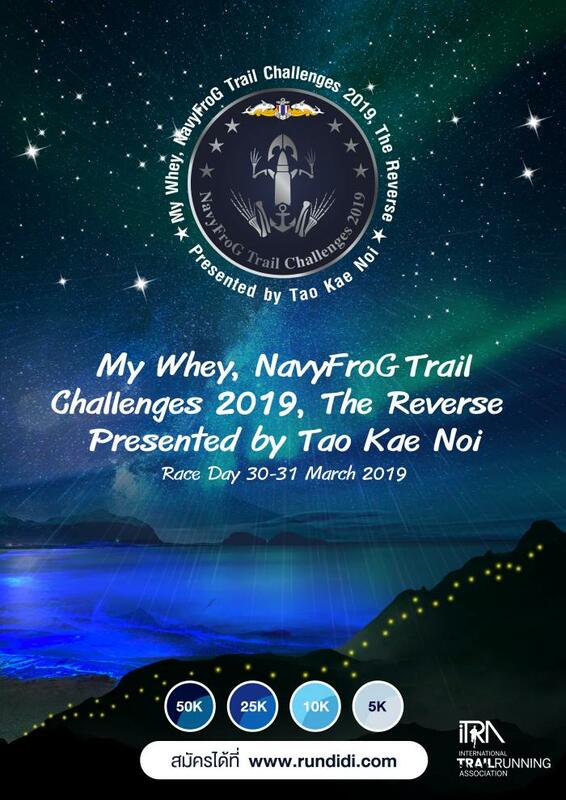 This idea came from the commander of SEAL who wants to use the Navy SEAL training to be an outstanding point of trail challenges. In addition to improving health and wellbeing to everyone. I do hereby certify that I am in good physical condition and do not suffer from any known disability or condition which would prevent or limit my participation in the program which I am enrolling. I fully understand that injuries are possible as a result of my participation in the program. Having read this waiver and knowing these facts and in consideration of your accepting my entry into this running race, I, for myself and anyone entitled to act on my behalf, waive and release “NavyFroG Trail Challenges 2019, The Reverse”, Inc., its officers, directors, agents, volunteers and employees, all states, cities, counties, the Metropolitan District Commissioner, other governmental bodies or locations in which events or segments of events are held, all sponsors, their representatives and successors, from all claims or liabilities of any kind arising out of my participation in this event, even though that liability may arise out of negligence or carelessness on the part of the persons named in this waiver. I hereby agree that in the event of the event being cancelled in whole or in part due to wind, storm, rain inclement seas or weather or other conditions, my entry fee Shall not be refundable. I grant permission to all of the foregoing to use any photographs, motion pictures, recordings, or any other records of this event for any legitimate purposes. © Copyright 2019 Rundidi.com All rights reserved.